North Korean leader Kim Jong Un and South Korean President Moon Jae-in attend the Inter-Korean Summit dinner on April 27, 2018 in Panmunjom, South Korea. (CNN) - South Korean President Moon Jae-in said Monday that US President Donald Trump would be a worthy winner of the Nobel Peace Prize for his involvement in the warming of relations with North Korea. A former South Korean President, Kim Dae-jung, won the prize in 2000 for his role in setting up a previous summit with North Korea, and his widow suggested Monday that Moon should also get the award. Moon demurred in response, saying the US President ought to get it instead. "President Trump should win the Nobel Peace Prize. The only thing we need is peace," Moon said during a Cabinet meeting on Monday, according to the Blue House, the South Korean presidential office. His remarks come three days after a historic summit that saw North Korean leader Kim Jong Un cross the border into South Korea for talks with his southern counterpart. 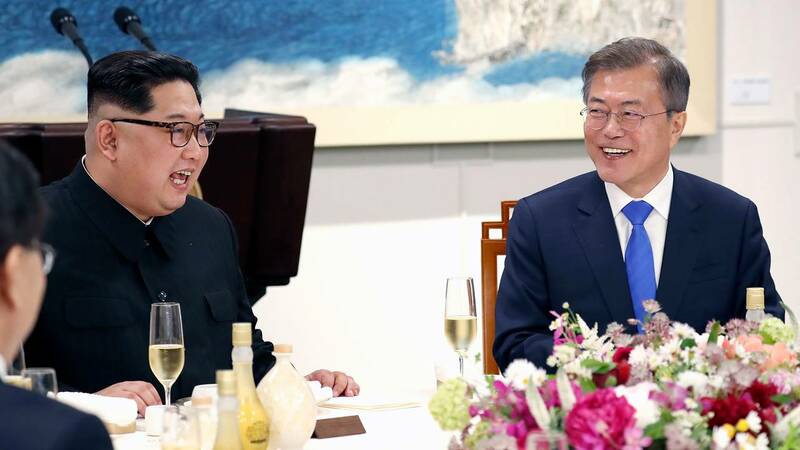 The two leaders spoke about the need for peace between their nations and pledged a "complete denuclearization" of the peninsula. Moon has previously credited Trump with making a "huge" contribution to bringing the North and South together for the landmark talks. During his New Year press conference in Seoul, the South Korean president praised Trump personally for his role in "(making) inter-Korean talks happen" and expressed his gratitude. At the time, Moon's assessment of Trump's contribution to the diplomatic breakthrough contrasted with the view from Pyongyang, where the state-run Rodong Sinmun newspaper on Monday criticized Trump for "boasting of 'diplomatic success,'" although it didn't mention the negotiations. Trump has also been keen to take credit for the developments in inter-Korean relations. "With all of the failed "experts" weighing in, does anybody really believe that talks and dialogue would be going on between North and South Korea right now if I wasn't firm, strong and willing to commit our total 'might' against the North," he wrote on Twitter in January. A meeting between Trump and Kim is currently being planned, although the US President has said he is wary about North Korea's approach. "Maybe it will be wonderful. And maybe it won't," Trump said last week about his upcoming talks. "And if it's not going to be fair and reasonable and good, unlike past administrations, I will leave the table." Previous winners of the Nobel Peace Prize have included Trump's predecessor, President Barack Obama, Pakistani activist Malala Yousafzai and Nelson Mandela.